1 TBSP OF VANILLA EXT. Start by mixing together your dry ingredients (flour, baking powder and kosher salt) into a medium sized bowl. Whisk together to blend and distribute evenly, set aside until needed. Next, in the bowl of a stand mixer, fitted with the paddle attachment, add in your room temperature butter and sugar. Cream the sugar and butter on a medium speed until light and fluffy in texture. (This should take 1-2 minutes). Now, bring the speed down to low add in your whisked egg, vanilla, and milk. Once all are incorporated add in your flour mixture one heaping tablespoon at a time. When the dough comes together, remove from mixer and place onto a well sugared surface (using your powdered sugar). Now, separate the dough into two disks, cover with plastic wrap and place in the fridge for 2 hrs. Once the dough has chilled remove from the fridge and place on a well sugared surface and roll out to desired thickness (I tend to go for 1/4 of an inch). Now, use your heart shaped cookie cutters to cut out two hearts in one. First cut out the large size, next center the small heart in the middle of the large heart, press down to create a small heart space in the center of the large heart cookie. Place on a lined sheet pan, spacing should be one inch between all cookies. Continue until all the dough is used. (You can re-roll and cut the dough as much as you like). Once all the dough has been cut and placed on the lined sheet pan, put the sheet pan into the fridge and allow the dough to chill for 10 minutes. (This ensures that your cookies will not loose their shape while baking). Next, place the chilled dough into a pre-heated oven at 375 degrees, and bake for 12 minutes rotating the pan half way through. Next, remove cookies from the oven and let sit on sheet pan for 1 minute. Now, remove the cookies carefully from the sheet pan onto a cooling rack and let cool completely. Next, make the candy center of the cookie with Isomalt. Follow the instructions on the bag of Isomalt to cook down and heat up the hard candy. 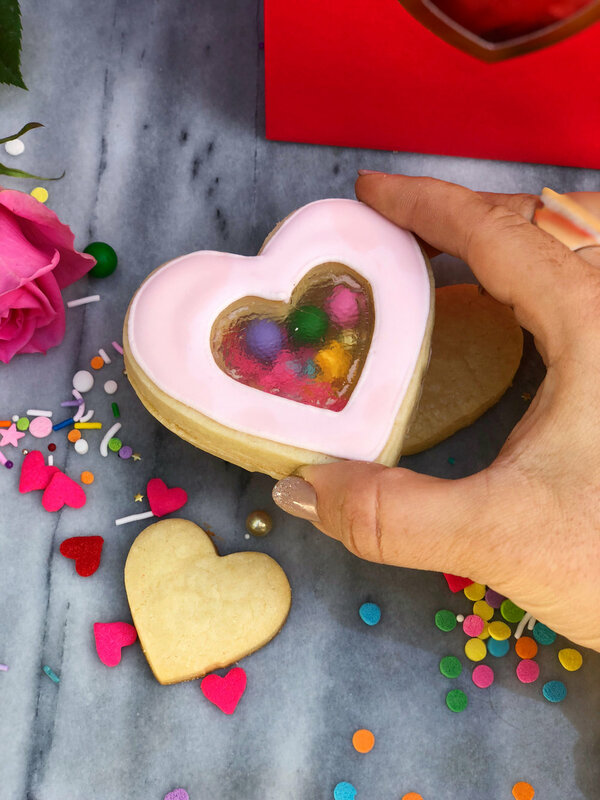 Now, place the large heart shaped cookies front side down onto a Sil Pat or parchment paper lined sheet pan and pour prepared Isomat into the centers. Let dry completely before picking up. (Should only take 5-10 minutes). Next, to make the royal icing. Start by placing 5 Tbsp of meringue powder into the bowl of your stand mixer with 1/2 a cup of hot water and whisk together by hand for 30 seconds. Now, add in the cream of tartar and whisk again for another 30 seconds. Next, place the bowl onto the mixer, fitted with a paddle attachment and add in all the powdered sugar. Mix on low until incorporated then move speed up to medium for ten minutes until frosting is light and fluffy. Once the icing has come together, separate into as many bowls as icing colors you would like to make. Make sure to cover each with a damp paper towel so not to dry out while mixing each desired color. (MAKE SURE TO HAVE AT LEAST ONE COLOR OF ICING THAT IS THICK ENOUGH FOR THE OUTLINE PIPING OF YOUR COOKIE). ICING CONSISTENCIES: PIPING CONSISTENCY: add about 1/2 a tsp -1 tsp of water, to one cup of prepared icing. It should be thick and not too runny. FLOODING CONSISTENCY: add 1/2 a tsp of water at a time to one cup of prepared icing until it reaches a ten second icing; when you draw a line trough the icing it should disappear within ten seconds. Now that you have your desired colors and consistencies ready to go, place each into a piping bag fitted with a #2 tip and tip cover. Using a rubber band tie up the top of the bag securing it. Next, pipe out the outline of the hearts both big and small ( on the large cookie) then fill in with desired color of flooding consistency icing (10 second icing). Let the icing completely dry, 12 hrs to overnight before going to the next step. Now that your cookies have been iced and hardened, you can fill the center of one with the sprinkles of your choice. Next, use your icing as glue and place a good amount around the cookie. Next, place another large heart with Isomalt center on top to join the two together.